Crown or ‘paper’ roads were established during the settlement of NSW and are part of the state’s public road network. 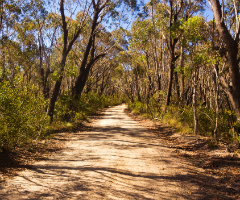 Generally, Crown public roads provide access to freehold and leasehold land where little or no subdivision has occurred since the original Crown subdivision of NSW in the early nineteenth century. Over time, the use of some Crown roads and surrounding land has changed, which has led to a change in ownership or management of some Crown roads. The department manages Crown roads under the Roads Act 1993 (the Roads Act) and in line with with the Administration of Crown roads policy and guideline. As changes to the Roads Act took effect 1 July 2018, some processes for the use and management of Crown roads have changed and are summarised below. The department recognises that many Crown roads within the public road network are not required to maintain public access. In these cases, Crown roads may be sold or closed without compromising the broader public interest. To apply to purchase a road, please complete the Crown road purchase application form and review the steps in the statutory process timeframes which explains the time it takes to process applications. To make consultation for the roads program easier, the department has developed an online search facility. This will help you view and search current notices for public roads that are proposed to be closed and/or sold. These notices will continue to be published in local newspapers. The notices will remain available online for the full 28-day submission period, from date of publication. and print full details of the road advertisement and supporting maps. To make searching easier, we've developed some guides to help. For development and planning reasons, councils and other roads authorities may request the transfer of a Crown road. This can allow the road to be maintained to council construction standards, as use of the road changes over time. Crown road transfer initiated by the department—the department will consult with council before a Crown road is transferred, with each proposed transfer considered on a case-by-case basis. The department has established criteria for determining whether a Crown road is suitable for transfer to council. Read the transfer criteria for more information. facilitating a strategic sale under the Crown Land Management Act 2016. The department is not a road construction authority and we do not undertake road construction or maintenance activities on Crown roads. The department may allow a road user to undertake small-scale works on certain Crown roads. road works to establish access along an unformed road. If large-scale construction must be carried out, the department will consider whether transfer of the road to council is more suitable, so construction can be administered according to standards specified by local council as the roads authority. The department can only administer the closure of Crown roads. Local councils are responsible for the closure of council roads within their local government area. The department also closes dedicated public roads in the western lands of NSW in the unincorporated area. All enquiries to close and/or purchase a council road should be directed to local council. If you have a Crown road within or next to your property and you want to fence it within your land for grazing purposes, you will need an enclosure permit. The enclosure permit lets you graze the land but does not give you exclusive possession or ownership of the Crown road. You’ll still need to keep the Crown road available for access. The department issues enclosure permits to individuals and businesses that have Crown roads within their property and want to avoid fencing the road out. You will need to pay an annual rent to the department for the use of the land. Read our Enclosure permit FAQs for more details. View and search current notices for Crown roads that are proposed to be sold or closed.